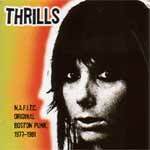 The Thrills were one of the many killer bands that came out of the Boston scene in the late-'70s that never managed to get huge, but did leave a trails of terrific recordings in their wake. Playing famed clubs like The Rat and The Metro Theater alongside contemporaries like The Real Kids and DMZ, and opening for the like of the Ramones, The Thrills played exactly what you'd assume and hope they'd play: stripped down, raw power punk rock and roll with a little new wave and '50 Chuck Berry influence thrown in for good measure. Barb "Wire" Kitson, The Thrills do indeed thrill on cuts like "(Hey!) Not Another Face in the Crowd" and "Don't Come Back," and sound like the Yardbirds on crank on "Rave Up Tonight." But it's on tunes like "David Berkowitz Blues (44 caliber Killer With the Talkin' Dog)" and "Summer Street Massacre" where the band's high-energy charm, musical chops and dark sense of humor come colliding together in a brilliant power-pop-punk mess. Fun stuff to be sure. Oh yeah, N.A.F.I.T.C. stands for "Not Another Face in the Crowd." Go figure.